I've made this fruit ladder a million times. It is super simple, fast, looks impressive on any dinner table and is delicious. The dough works beautifully, is very forgiving and never fails!! You can make this ladder with any pre-cooked fruit filling (home made or commercial). I have had people tell me this looks hard to make, but trust me, it is not. There is just one little trick: roll the dough out into a rectangle and then move it to your baking sheet BEFORE you try to make the ladder. You can't move the ladder (and keep it's shape) after it is filled. This dough is the real secret to this recipe. Mix ingredients with an electric mixer (the dough will be a little sticky before it is chilled). 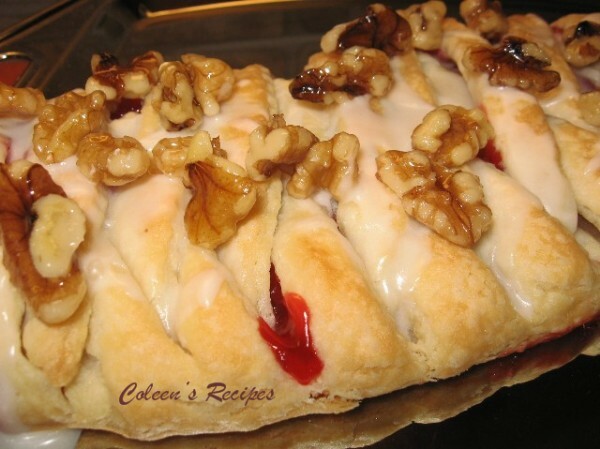 Divide dough in half (this recipe makes TWO ladders). Put each ball of dough in some plastic wrap and rough it into a large disk shape…cover well and refrigerate 1 hour (extremely important). After an hour, remove from fridge and flour your counter top and rolling pin. Roll one of the disks into a rectangle about 15” x 10”. Pick up the crust rectangle (it will not break) and lay it on a lightly greased baking sheet. Find the center of your crust rectangle, and spread your fruit filling in a 3” wide strip, long-wise, right down the center of the rectangle (keep the fruit about an inch away from each end of the ladder). Each ladder will take ½ can of commercial fruit filling. Cut the dough, on both sides of the fruit, into equal strips, but be sure you stay about an inch away from the fruit filling. Pull the strips back over the fruit (one at a time) in a criss-cross fashion (the strips just lay on top of each other, don't crimp). The only part that is crimped is the very first strip (on each end of the ladder), it should be pinched together. Bake the fruit ladder for 30-40 minutes (in a preheated 350 degree oven) or until lightly golden. Run a spatula under the ladder to make sure it is loose, and then slide it off onto a serving plate. Drizzle it with a simple powdered sugar glaze and decorate with nuts (I like candied nuts), sprinkles, or any decoration you like. I have tried lots of different fruits, cherry, lemon, raspberry, blueberry, apple strawberry, blackberry, etc. Commercial pie filling works as well as home made. WOW! This looks delicious! I am going to try and make this for Christmas morning brunch, thanks for the great recipe! You have made this look pretty easy. I would love to try this. Thanks Coleen! that looks so yummy! thanks for sharing this post coleen:) have a nice day. This is moving to the front of the line for teacher gifts! It looks amazing! Who wouldn't want to receive one of these?! YUM! I'm all over this one. I have some raspberry pie filling or maybe something almondy. Thanks. That looks easy enough even for the non-baker (ME!) to make. I made and froze some homemade apple pie filling this fall - I think it would be wonderful in this. 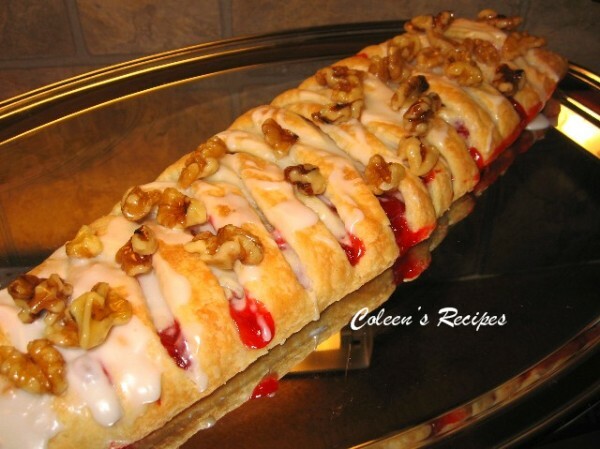 Thanks again Collen for a great recipe! Looks easy, delicious and so pretty! 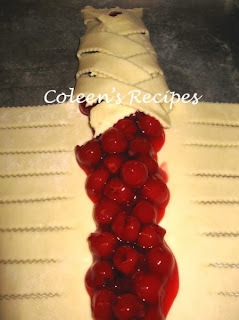 This looks delicious, Coleen, and I love your red and green print and the new look of your blog. Just wanted you to know how much I appreciate your simple but delicious recipes. We've made 5 of these for teachers' gifts, in addition to your microwave peanut brittle and microwave candy plus a few other goodies. I've run into a couple of teachers and they have remarked about how beautiful and delicious the fruit ladders were. Thank you! Thank you we are having this for Christmas Desert! Hmmmm...spending New Years with the grands and Sweetie-Pi's sister and BF; it's an overnighter. This would make a fantastic presentation for the New Year's Day breakfast! Thanks Coleen! Oooh...sounds great. I'm a parchment paper fan so will be using that to transfer to baking sheet.....then make the "ladder".